One of the pivotal quotes that shaped my life growing up was from one of my favorite musical icons, David Bowie: “The worst trick God can play is to make you an artist, but a mediocre one.” Internalizing my version of his message, my motto became through high school and university that I would rather be an A or an F student than a C student. Living by that belief, I developed two distinct personality traits. Either I would edit myself to please people with niceties, or I would plow through life with a fiery feistiness. Both extremes were fueled by a drive for what I understood to be “perfection”. The tension that lay between these two, and the fervour I put into trying to be “perfectly A” or “perfectly F”, eventually consumed my health and wellbeing. By the end of high school and into my first year of university, I was exhausted and stressed because I was not being authentically myself. Though it took me completing university and facing the rest of my life to figure it out, I eventually realized that I had allowed other people’s voices, wishes and dreams to unconsciously run my life. My feistily polite drive for “perfection” was based on the fear that if I were myself, I would not be loved. I share this because I believe this fear is not unique to me, but is surprisingly common. Sometimes in early childhood, and sometimes as residue from past lifetimes, we form the idea that we must be a certain way in order to receive the love we need to feel safe in the world. In many cases, we may not be aware that we have developed this belief. We only know that when we consider making a change, we may feel anxiety and resistance without knowing why. In the process of trying to come to terms with which inner voices were mine and which were not, I discovered that my extreme personality traits were like healthy qualities on steroids. Through various illnesses and harsh life lessons, I learned to dial down the intensity of my attachment to an idea of perfection. I redirected the root energy that was driving it into more life-affirming expressions. I discovered that within my drive were many strong qualities, such as immense creativity, powerful zeal and an ability to harness raw momentum out of almost any situation. These qualities became my allies. Drawing upon this, I learned to honour my inner voice rather than cater to the voice of others. I am fond of the late self-help author Debbie Ford’s shadow work approach. It helps transform lives, not by trying to get rid of “bad” qualities, but by finding the hidden teachings in all. Learning to be true to myself has meant letting go of a lot of excess. I have had to look at releasing a tendency to become entangled in what others think. I needed to look at my defensiveness, learning to soften a general, ongoing feeling of being judged or attacked. I have had to watch the death of my niceties and my feisties so that I could find the courage to go within and fiercely honour my own unique rhythm and voice. As I began to live a more soul-directed life, I realized that doing so was not really the norm. Looking back at the construct I had started to leave behind, I saw that though on the surface it seemed that society supported excellence, the pull to live in the status quo was stronger in the collective consciousness. It seemed most people were satisfied with fitting in and being “normal”. Midway through university, I started to wear a pin on my coat that asked the question: “Why be normal?” I meant it as a provocative and sincere question as to what normality really meant to the world at large and to anyone who noticed me wearing it. What I came to realize is that there is nothing wrong with being an A, B, C, D or F student, if that is who you truly are. We each are unique expressions of a divine force and it is our job to discover what that is and express it in our life. The problem is, most of us go through life on autopilot, as though we are asleep, wondering why life feels like a bad dream, tending to react to our unconscious thoughts and desires rather than learning to live fully and authentically. When you begin to wake up, you start to see what the mindfulness teacher Jon Kabat-Zinn calls “the full catastrophe” of our lives. You learn to see the depth of your reactivity, the ways you give your power away to people and things because you perceive the source of love and happiness to be outside yourself. Deeper still, you learn to touch and be present for the silent voices like “I can’t” or “I am not loved” or “I am unworthy” that unconsciously influence your thoughts and actions. When you come upon these old, hidden places within us, be willing to pause and befriend them, rather than run from them in an attempt to deny any pain you may feel. By welcoming your fullest self, you access your power. You learn to see that your dreams are feasible, and that you have all you need to realize them. You understand that your main obstacle has been yourself (no one else) and the antagonistic way you have seen the world. I began to find my own response to the question “why be normal?” as I followed an impulse, a powerful yet quiet force that lay waiting behind my conscious thoughts. It was within me and made no logical sense. But did that matter? I felt alive. I felt open. I felt connected. And in so doing, I was a better, more inspired and loving person. In learning to find our unique rhythms, we need to try things out. I went through a phase of sporting short, electric purple hair with fluorescent blue eyebrows. My regular dress was multi-coloured body paint hidden mysteriously under a wardrobe of solid black. Only after a phase of leopard skin, tutus and combat boots, followed by a love affair with haute couture, did I reveal my joy of full colour. That was when I got rid of everything black. When I was living in New York City, I went through a phase where everywhere I went, I carried a rubber goldfish in the palm of my hand, that I called “Fishy”. There was no sense in it. It was my own whimsical performance-art piece. The jelly-like goldfish was my friend, so it went where I went. People got used to it and accepted it. It was funny. It made people pause, do a double take and laugh. I loved that pause. I loved the space it gave because it allowed for more authentic connections as we stepped out of “normal”. A friend of mine from New York, Kelly Cutrone, published a book a few years ago called Normal Gets You Nowhere that shares her own brand of self-love. She believes normalcy inhibits the unique gifts everyone can offer the world and doesn’t necessarily bring happiness. I agree with Kelly that when we are true to who we are, it’s easier to be honest, it’s easier to be compassionate, and the world is a much better place. Being true to who you are is an ongoing process as you meet each moment of your life. It is not a final destination point but a ripening as you get to know yourself more fully. To be yourself requires a fierce courage because there is social momentum to “normalcy”, staying asleep and not awakening your true nature. 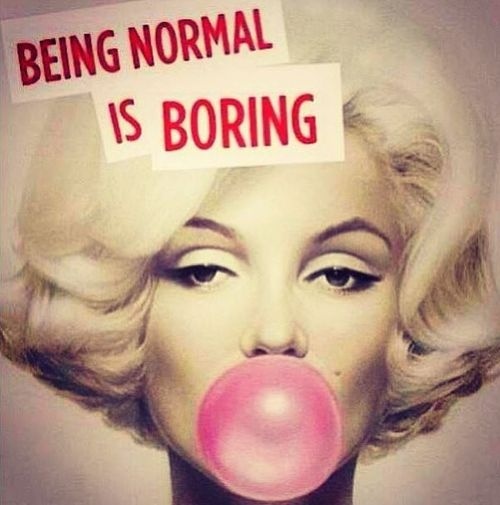 In effect, there is no “normal”. There is either asleep or awake, to varying degrees. When you honour your true nature, you shed light for others to do the same. But not everyone is ready or interested in such honesty. Connecting to your inner fierceness keeps you honest, instinctual, and in alignment with nature. Tapping into courage helps you move towards greater expansion. Developing compassion helps you understand the tendency to want to remain asleep. Because that tendency exists within us all, you can see yourself in others. However, in this moment, you choose to awaken. When you are naturally who you are, you align your energy with the force of nature, a most potent force. It does not apologize for who it is. It does not sheepishly try to be something else. It does not look for approval. It simply is. The flower does not question that it is a flower, nor does the lion question its nature. The flower quietly reflects beauty. The lion will tear off your head if you get too close. The flower does not question if it is too beautiful or delicate, nor does the lion struggle with guilt, doubt and self-reproach for the force of its claws. If the lion pretended to be a mouse, the lion would be unhappy. If the flower were crushed by concrete, it could not grow. We all are works in progress, letting go of excess, reclaiming what we lost, discovering the new and rediscovering the forgotten. Driven by the ego that knows only fear and disconnect, our minds tend to seek control and manipulate reality to suit our core beliefs. In turn, we create complexity in the moment, in which we become entangled. By becoming mentally convoluted, we lose touch with the force of our innate intelligence that arises from deep within through our connection with nature. If your joy is singing, then sing. If your joy is being a lawyer, then love it. If you want to sit and read a book, then lap it up. If you need to tell someone how you feel, then let that person know. And do it completely, with every ounce of your being. Whatever it is, if you stifle that connection with nature, your connection to who you are, everyone loses. When you honour it, everyone wins. We often mistake compassion for sentimentality and love for sweetness. Love to me is fierce, an unbridled force that defies reason. It is the force that says, “I am that I am.” Compassion is an expression of that force through action. It calls us to serve through love for being here, for being part of it all. When you don’t say what you need or share who you are, you are living in fear and, in effect, wasting your life and everyone else’s time. This life is short. The perils are many. Give yourself the gift of sharpening your inner clarity. See who you are and connect to your unique inner light so that you may shine as a beacon in the world. Some people may not get it. Some people will. Either way, it doesn’t matter. What matters is that you feel alive, plugged in and real. In tapping into such rooted, vital expansiveness, you send a message to the universe of possibility, of interconnection, saying “yes” to life. You have created a radical revolution – by being exactly who you are. Today, and every day, I celebrate you.